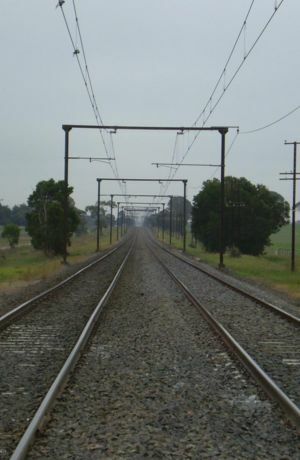 A double-track electrified (1500v DC) railway line in Victoria, Australia (gauge: 5' 3"). Railway tracks (U.S.: Railroad tracks) are the tracks on which trains run. Railway tracks normally comprise three main components: The rails themselves, the sleepers (U.S. and Canada: ties) on which the rails rest, and the ballast which holds the sleepers in place. In addition, there are the various fittings that hold it all together. The gauge of a railway is the distance between the rails. Most railways in North America and Europe use a standard gauge of 4ft 8½in. Flat-bottom rails showing their cross-sectional shape. A reversible rail now used as a post. Rails are usually made of steel, and in cross-section are usually shaped roughly like the capital letter "I", except that the top part (the "head") is much thicker than the bottom part. These rails are known as flat-bottom rails. In the United States this type of rail is called "T" rail. Another type of rail is symmetrical in cross-section, or nearly so, with two "heads". Originally, this "reversible" rail was to allow the rail to be turned over and used again, but deterioration where the bottom "head" sat on the sleeper plate put an end to this practice. However, similar rails, known as bullhead rails, continued to be made and used, mainly in Britain, which used the same fittings as the reversible rails. Yet another type of rail is tramway rail, which is similar to flat-bottom rail but with a larger head containing a groove for the flange of the wheel. These rails are designed to be laid flush with the surface of roads with the groove for the wheel flange contained in the head of the rail. This type of rail is called "girder" rail in the United States. Rails are made in various sizes. In America, rails are described in imperial units, whilst in Europe they are described in metric units. Australia has switched from using imperial units to metric units. Depending on the use of imperial or metric units, rail sizes are usually expressed in terms of pounds per yard or kilograms per metre. Coincidentally, the pounds-per-yard figure is almost exactly double the kilograms-per-metre figure, making rough conversions easy. Sleepers (U.S. and Canada: ties) are the transverse members that support the rails, and hold the rails to the correct gauge. Traditionally, sleepers have been cut from wood, but reinforced concrete sleepers are in widespread use today, and steel and plastic sleepers have also been tried. Sometimes, particularly with tram lines, the rails are supported directly on a concrete slab or other firm foundation, and metal rods connect the two rails together to hold them to the correct gauge. Supporting the sleepers is ballast, usually crushed rock. Ballast is designed to provide good drainage, to hold the sleepers in place, and to provide some flexibility to the track. On some lines with only slow and light traffic, other materials such as sand and ash have been used in place of crushed rock. In special circumstances, such as inside tunnels, the ballast is sometimes replaced with a concrete slab. This takes less room (hence its advantage in tunnels), but must be laid very precisely as there is no "give" as there is with conventional ballast. A variety of fastenings are used to hold rails to sleepers, and to join rails together. Fishplates (US: joint bars) are short bars that are bolted to each side of the adjacent ends of two rails to join them together. Typically, fishplates have four or six bolts attaching them to the rails. Fishplates can also have insulating material placed between them and the rails, to keep two adjacent rails electrically separate. Electric currents are often used for the detection of trains. Rails are often welded together after being laid, rather than being bolted together. This is known as continuously welded rail. Two baseplates under a welded rail joint. The left plate has a screw holding the plate, and a spring clip holding the rail. The right plate has a spike holding both the rail and the plate. Baseplates (US: tieplates) are the metal plates placed between sleepers and rails. They serve to spread the weight of the rail out over a larger area of the sleeper, and to provide a small camber to the rail. On lines with light traffic, baseplates are sometimes dispensed with, and the flat-bottom rails are laid directly on the sleepers. Various fittings are used to attach rails to sleepers. Large spikes (sometimes known as dogspikes, probably from the shape of the head in some versions) are sometimes used to attach rails (or baseplates) to the sleepers. The spikes have a head that protrudes from one side of the spike, and this head overlaps the base of the rail. Instead of spikes, heavy screws with large heads are sometimes used to attach rails to sleepers, or baseplates to rails. Spring clips, such as those made by Pandrol, are a more recent and now very popular way of attaching rails to baseplates. This page was last modified on 1 March 2017, at 11:29.